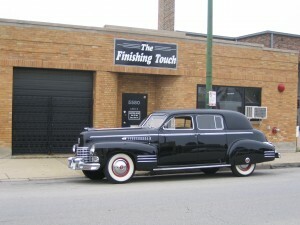 Facilities & Processes | The Finishing Touch Inc.The Finishing Touch Inc.
Concours Quality Chrome. We Don't Do Average! Dennis Crooks – Quality Restorations, Inc.
Our front office staff gladly answers your questions and arranges for all quotes on potential jobs. While we can always provide a guesstimate based upon pictures alone, all parts eventually need to be shipped to The Finishing Touch Inc. to determine two things: 1) their actual pre-restoration condition, and 2) to decide which steps are required for concours quality refinishing. Our front office coordinates all price quotes, including any special instructions or details. After they secure your approval via mail or fax to proceed with your restoration project, it is input into our production schedule. Normal turnaround time for completion of your restoration project averages 8-10 weeks. When your shipment arrives, your parts are accounted for personally by the owner himself. Once inventory is complete and each piece is archived via photography, your part is inspected for condition of core. At this stage, each piece is individually evaluated according to our in-house itemized Estimating Sheet. (Please Note: All special instructions are denoted at the bottom of the Estimating Sheet.) We use this form to clearly outline all of the necessary procedures that a part requires in order for it to be masterfully restored. Only at this time can we fully assess the exact costs associated with your unique restoration project. The stripping process begins with the removable of old plating to return the piece to its original base material. Next, all paint grade areas and the entire backside of the part is thoroughly sandblasted. Because both of these steps create the critical foundation for the restoration process to begin, we take them very seriously. At The Finishing Touch Inc., we believe that what starts right ends right. During the surfacing stage, your part is filed, surfaced, and then blocked by hand using air grinders of various types and sizes. All of our blocks are handmade in order to maintain the integrity of the piece, which is often a combination of flat surfaces and sharp details. Surface preparation is 80% of the platting process, so it is highly labor intensive. In addition, since we guarantee a concours quality fit and finish on every job, we how light buff the part to a semi-mirrored finish before any plating begins to ensure that the base material surface is correct. This extra step is a necessary precaution because concours quality chrome especially magnifies what is underneath. Remember, plating does not fix car parts, craftsmen with expert hand grinding skills do. This is why, at The Finishing Touch Inc., we believe surfacing is the most critical step in the restoration process. The successful re-plating of any car part requires vast and thorough knowledge of both the type of metal that is to be plated, and the knowledge of the chemistry required to complete this process. We start with state-of-the-art cleaning and acid-based products to meticulously clean every part. After several rinses, we apply a cyanide copper substrate, followed by a bright acid copper substrate, to fill any microscopic porosity remaining in the part. Keep in mind that these coppers do not fill pits; they only seal small microscopic pits. When pits cannot be removed by hand grinding alone (due to their depth or size), the following additional steps must occur. To fill severe pitting, the part is first surfaced to the point of no loss of detail. If the pit(s) still remain, the part is drilled to remove the pit(s) and all surrounding deteriorated material. At this point the part is cyanide coppered, filled with lead, re-blocked, and then run through the copper processes a second time to add a cosmetic layer to cover the lead repair. Robbers are built to keep plating away from areas where we do not want copper build up, and auxiliary anodes are built to draw copper to areas where more material is desired. After the base coppers are applied to the car part, the part is removed from the plating tank and returned to the surfacing department. The part is re-inspected, lightly re-surfaced, and re-blocked to ensure that detail, surface, and fit are all correct. Next, the part travels to the polishing department where our polishers, utilizing a wide variety of air-driven air grinders, and both small and large wheeled polishing lathes, turn each finely sanded car part into a mirrored finish. Our polishers are superior artisans who know exactly how to produce the finest polished finishes achievable in the concours chrome industry today. Period. Our concours quality plating process requires not only perfect chemistry, but also optimal tank size and filter design to accommodate a wide variety of car parts, ranging from wing nuts to bumpers. All of these careful considerations allow for the ideal coverage of the metal materials used during the plating process. 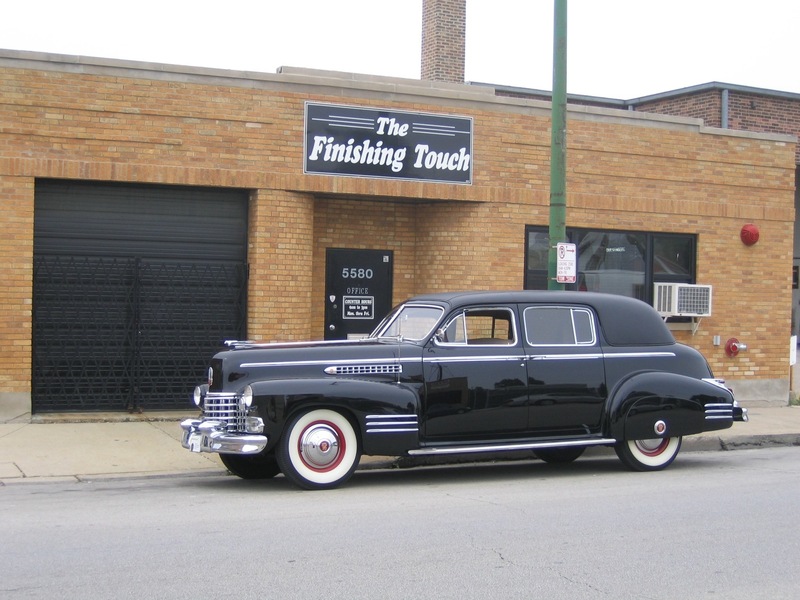 Once the nickel and chrome plating is complete, the part needs to be “near perfect.” At The Finishing Touch Inc., we like to say, “98% or better.” That’s why we’re known for employing the finest plating technicians in the industry. After a part is plated, the part returns to the quality assurance room for one final inspection for any visible imperfections. Equally important, each piece is now tested to meet our guaranteed fit standard. Rest assured that from riveted pieces to custom-made hardware, our skilled artisans have the ability to disassemble and re-assemble even the most complicated projects to your complete satisfaction. Once fit is confirmed, the backside of each part is painted for protection. If there is any detailed paint work required, it is also performed at this time. Finally, the part is cleaned, wrapped, and labeled with its pre-assigned job number. It is then stored in a drawer to protect it from any possible damage before shipping, or while awaiting the completion of any remaining parts to fulfill the entire job order. I hope you’ve enjoyed this bird’s eye view of how we make cars “bling” at The Finishing Touch Inc. If I’ve made our process of concours quality chrome plating sound easy, it’s not. Rather, we take painstaking care of your restoration project from the initial estimate to the final shipping, because we know that whether your car is one of a million—or one in a million—it means the world to you. And, because it’s that important to you, it’s important to us, too. We enjoy what we do here, every day, every step of the way, and it shows. Try us and you’ll understand why we say that when it comes to concours quality chrome, “We don’t do average!” Ever. Mark Silich Owner, The Finishing Touch Inc.